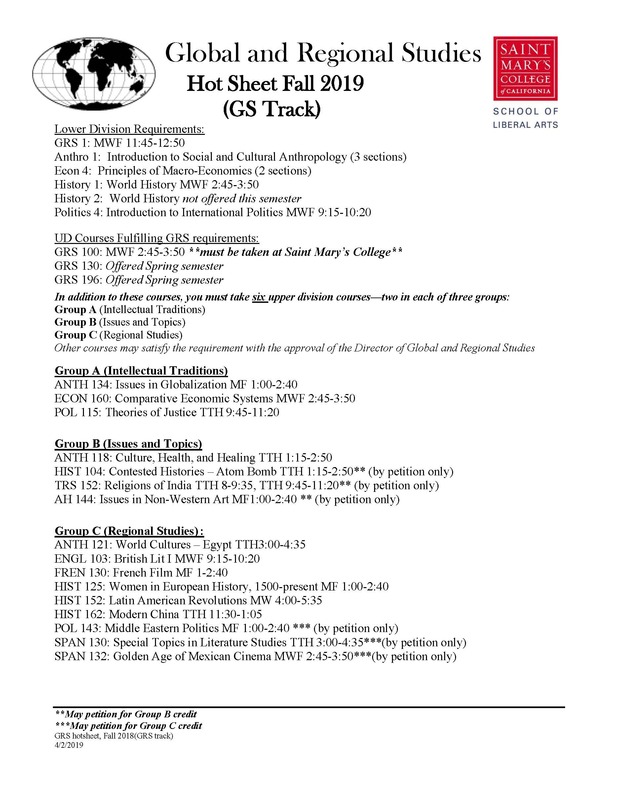 The GRS major is an interdisciplinary major. The great majority of lower and upper division course requirements for the major are offered through the various departments that support the major program. Those course descriptions are found under the respective departmental program listing of courses. The following four courses are exclusive to the GRS Program. This course introduces students to the principal concepts and theories scholars and practitioners employ to analyze and understand global phenomena including an examination of historical, economic, cultural, and political events, institutions, structures, and processes. 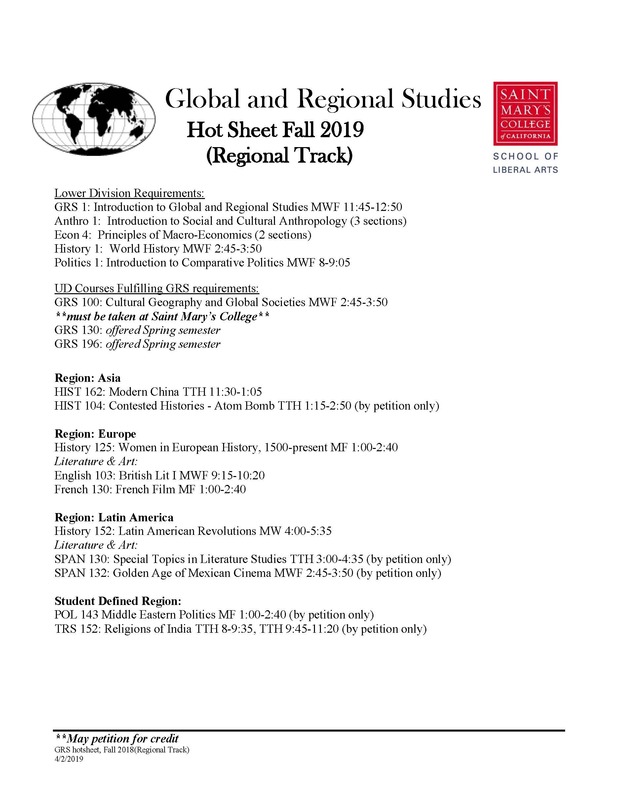 In addition, the course introduces students to major world regions and examines the connections between regional and global outcomes. Theories of globalization and key global issues are addressed including human rights, global inequality, poverty, population and migration, terrorism, global trade, and environmental issues. This course exposes students to the breadth and excitement of the field of geography. Cultural geography studies the ways people shape and give meaning to their environment and allows us to look at the fascinating variety of human activity in the world — the human landscape. Geographic knowledge is vital to understanding national and international issues that dominate daily news reports. This course examines the relevance of geographic methods and concepts to social science topics such as: agricultural patterns and practices, architecture, ethnic traditions and conflicts, gender, health, migration, population, political economy, poverty, religion, resource utilization, social change and urban planning. Prerequisite: Anthropology 1. This course may only be completed at Saint Mary’s College. This course can be taken as an elective to help fulfill the requirements of the Global Studies track. Specific topics vary. As a culmination of their studies, students are required to complete a senior thesis on a topic of their choosing. The thesis should display a student’s ability to conduct independent research, and to write and think critically about salient issues related to their chosen minor and region. This course should be taken in the senior year. This course may only be completed at Saint Mary’s College.